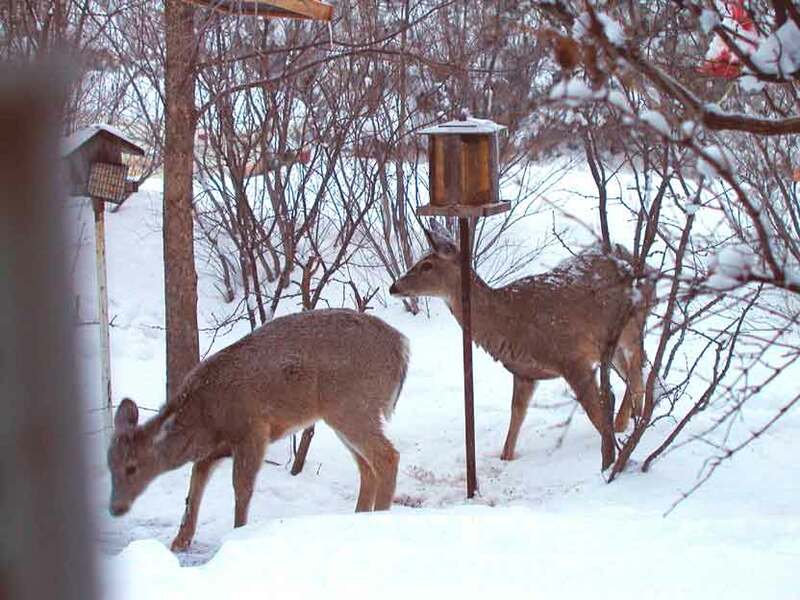 The Chronicles of Cardigan: Can deer poop be harmful to deer? 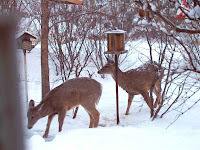 Can deer poop be harmful to deer? Anyone know how disgustingly vile dog vomit laced with deer poop looks? Not my yard, BTW. I bet there's poop there though. Unfortunately, I am all too familiar with what that looks like. And smells like. Rufus has a certain affinity for eating it and then smearing it all over his head/neck/collar. Dis-gust-ing. We have a small creek that runs through our backyard, so it's Deer Central Station all the time to the point they don't even mind Rufus anymore. He's happy to have such an ample supply of poop he never even bats an eye when there are deer in the yard. Nice guard dog! Not as tasty as cat poop though. That's Rufus' snack of choice - at our last house, our neighbor had outdoor cats and I was taking him to the vet constantly for his bad snacking habits. Now, no cats but we've traded up to deer! Yay! We have an albino doe that is really beautiful - so far she's about a year old and no one has killed her yet, including the stupid guy across the street that has a deer stand in his back yard. I'm just waiting for him to shoot one of the neighbor's kids with an arrow! Oh, and this is really OT, but I was wondering if you could indulge me on your thoughts of having two male dogs in the house? Any issues with fighting, marking furniture, etc.? You can email me if you want - lizblanks1@gmail.com . Much thanks! I'll send you an e-mail to answer your question. You do mean Rufus and a new guy (not two new guys), right? Yes, just one new guy. Two of my dog-centric friends keep telling me go male/female, but I've also picked up that corgi females are definitely not passive. So I was wondering what the dynamic with the boys was like? Yikes! I won't be experiencing that anytime soon in the city but here, we have to rhumba around other dog poops in the dog runs. :( A lot of manner-less owners around here!